A UK type 3 player arcade machine with a £250 Jackpot £1 play 95% payback. Random holds, nudges and hold after nudge. All wins can be gambled on the top super reels. Super reels pay 5 lines on any stake selected and the gamble meter can be collected anytime. 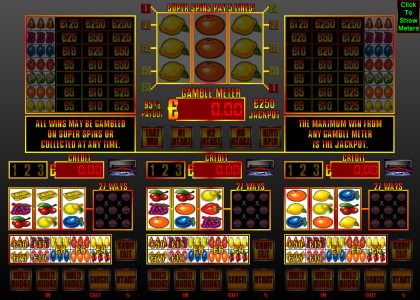 The maximum that can be won from the super reels is Jackpot! How far will you go, do you have the nerve to try and go all the way? This game has hide meters option and keyboard shortcuts. Once payment has been made please request your game code via email to activate your game fully. Game updates and codes are sent out as soon as possible.